Keeping a roof over their heads, the lights and gas on, food in the fridge, a car in the driveway — covering everyday expenses is Americans’ biggest financial concern, according to the Financial Burdens Survey from GOBankingRates. One in four Americans says that the high cost of living is the most challenging personal finance issue. The survey also reveals how Americans rank other common budget concerns from most to least difficult to handle. The survey also included questions that captured respondents’ demographic information, including age, gender, political leanings, income and debt levels, and household size. Cost of living had an average rank of 2.77 on a scale of 1 to 6, with 1 being the primary concern and 6 being the least concerning. Americans also said high costs of living are their top financial issue more often than other financial burdens, with 24 percent naming this as their No. 1 financial challenge. Americans view the high cost of living as their top personal budget concern despite reports that consumer prices — such as oil and gas prices — have dropped in recent years. The Social Security Administration tracks consumer prices and will often increase benefits to match an increase in the cost of living, but for 2016, the SSA announced there would be no cost-of-living adjustment to benefits. Healthcare costs ranked as more challenging overall on average than insufficient income, with average rankings of 3.15 and 3.43 out of 6, respectively. Insufficient income, however, was chosen more often than healthcare costs as the No. 1 concern, at 21 percent of the time. Healthcare costs were selected as the top financial challenge by 18 percent of respondents. Healthcare costs have been fluctuating in recent years as the Affordable Care Act continues to affect this market in new ways, and a 2016 GOBankingRates healthcare costs survey showed that 40 percent of Americans expect to pay more for healthcare in 2016 than they did in 2015. “Considering that healthcare costs have been rising steadily, Americans should be concerned about the impact this expense has on their finances,” Huddleston said. Facing these higher healthcare costs and other increased costs of living is challenging for Americans still earning stagnant wages that have barely inched upward in recent years. 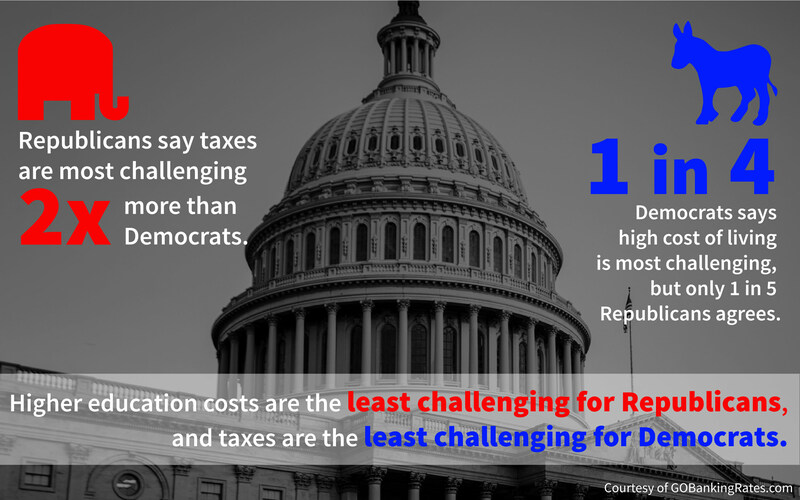 Taxes are ranked as the most challenging of these three issues, with an average ranking of 3.63 out of 6. Retirement savings ranked just behind taxes at 3.83, and higher education costs are last at 4.18. Taxes and retirement savings were each ranked as the No. 1 concern by 13 percent of respondents, and higher education was picked as the No. 1 challenge by 12 percent of respondents. These three financial issues might be less concerning because they have a limited impact on people compared with high costs of living and healthcare expenses, which affect virtually everyone year-round. Taxes, on the other hand, are considered by many people less frequently, sometimes only once a year to file a tax return. Higher education and retirement costs are tied to specific life stages and can be offset by options like scholarships and Social Security income, so they’re not as much of an everyday concern as the cost of living, for example. Several of the common financial concerns offered as answer options in this survey are tied closely to stages of life, and the results show that the highest-ranked money struggle for each age group reflected that group’s short-term or immediate financial needs more than a longer-term view of financial challenges. For example, only 6.6 percent of 25- to 34-year-olds ranked retirement savings as their biggest budgetary concern, whereas 20.2 percent of retirement-age boomers ranked it No. 1. Similarly, less than 1 percent of seniors 65 and over are thinking about higher education when ranking their top money challenges. With their attention — and budgets — consumed by making ends meet, many Americans aren’t even saving enough for an emergency fund let alone retirement. The results of this survey not only reflect an overall trend that Americans are struggling so much with cost of living that they are unable to save for long-term needs but also that they aren’t even ranking those long-term financial needs as a priority concern. This age group is the most likely to view higher education costs as a major challenge. Over a third (34.2 percent) ranked college costs as their No. 1 financial concern. “The cost of higher education has been rising, so more and more young adults are struggling to find a way to pay for a college degree,” Huddleston said. Moreover, fewer parents plan to help their young adult children pay for college, found a 2015 Discover Student Loans Annual Survey, and this trend puts a greater burden on students to cover these expenses. Older millennials make up the age group that is most challenged by insufficient income. 26.4 percent of older millennials ranked insufficient income as their No. 1 financial burden. Many millennials are still struggling with under-employment, low wages and other lingering effects of the Great Recession. Today’s 18- to 34-year-olds earn thousands less than the same age group made in past decades, according to a 2016 report from social policy advocacy group Generation Progress, and 70 percent of minimum-wage workers are millennials. The responses in this survey show that the gap between income and cost of living presents a significant challenge to millennials. Gen Xers (ages 35 to 54) say taxes and high cost of living are their biggest financial burdens. More than any other age group, Gen Xers are concerned about taxes, with 16 percent ranking this as their top financial challenge. Gen Xers tend to have higher incomes than millennials, but these higher wages also put a higher tax burden on this group. In fact, taxpayers ages 35 to 54 paid over a third (35.7 percent) of total taxes collected by the IRS in 2012, according to the Tax Foundation, with older Gen Xers (ages 45 to 54) paying the biggest share of taxes at 18.2 percent. Keeping up with the high cost of living is the most common challenge for younger Gen Xers (ages 35 to 44), selected as the No. 1 financial concern by 26.3 percent. High cost of living was ranked No. 1 by 26.3 percent of older Gen Xers (ages 45 to 54), and insufficient income and healthcare costs were each ranked No. 1 by 22. 6 percent of this age group. The high cost of living is likely felt most acutely by Gen Xers because this group has so many financial demands. Dubbed a sandwich generation, this group faces financial issues and costs that arise from raising children as well as caring for aging parents. Their higher incomes might not be enough to keep up with the higher costs of this stage of life, which often includes a range of healthcare costs, from child delivery to assisted living care for their parents. Baby boomers and seniors are the most likely to say their top personal finance concerns are healthcare costs (at 23.9 percent each) and retirement savings (about 20 percent each). They are at least twice as concerned about managing their retirement savings as Gen Xers and millennials. “It’s no secret that the savings rate is low in America,” Huddleston said. “A GOBankingRates retirement survey recently found that one in three Americans has save $0 for retirement.” The same survey revealed that about three-quarters of savers 50 and over are behind on retirement savings. “People certainly should be concerned if they’re not setting aside enough for retirement and should make it a priority,” she said. Baby boomers rank high cost of living as their No. 1 challenge 26.4 percent of the time, more than any other group. Seniors, however, are the age group least challenged by high cost of living, with just 19 percent selecting this as their top answer; however, they rank insufficient income and healthcare costs as their top two personal finance concerns. Women are 25 percent more likely than men to name healthcare costs as their No. 1 financial burden, and they are 30 percent more likely than men to find higher education costs challenging. Men are 30 percent more likely than women to name retirement savings as their top financial challenge and 36 percent more likely to find taxes burdensome. Another factor holding women back financially is the gender pay gap; women earn just $0.79 for every $1 earned by men. This pay gap can persist even among high-earners, with a recent analysis of MBA graduates from Bloomberg showing that women with MBAs earn $35,000 less than their male peers within eight years of graduation. Despite earning much less than their male peers, these female graduates face the same education costs and student loans. The pay difference puts a disproportionate burden on women, who must cover or repay the same high costs of college with smaller post-college incomes. For men, higher earnings can bring other frustrations, such as having to pay higher taxes on that higher pay. But even though they list retirement savings as a top financial burden, their prioritization of this budget factor is putting them ahead of women in retirement savings. GOBankingRates’ 2016 retirement survey revealed that more men are on track to save enough for retirement than women. The survey asked respondents which party they planned to support in the 2016 presidential election. Among the two major political parties, personal finance concerns differed greatly. Democrats are twice as likely as Republicans to say higher education costs are their No. 1 personal financial burden. Democrats also ranked insufficient income as their No. 1 financial burden nearly 50 percent more often than Republicans did. People earning lower family incomes of $30,000 or less are about twice as likely to identify as Democrats as Republicans, according to Pew Research, and messages addressing income inequality tend to resonate with these voters. Both major Democratic candidates, Hillary Clinton and Bernie Sanders, have proposed plans to make college affordable or even free in the U.S. Similarly, Sanders’ income inequality platform and Clinton’s attention to the gender pay gap have garnered them loyal followings. Republicans are 70 percent more likely than Democrats to be concerned with healthcare costs. Republicans are twice as likely as Democrats to say taxes are their No. 1 financial challenge. Republicans’ concerns over healthcare costs might be related to the party’s overall dislike of the Affordable Care Act, which had an approval rating of just 14 percent among Republicans in a 2015 Gallup Poll compared with 83 percent approval from Democrats. When it comes to taxes, Republicans are also less likely to have a favorable view of the current tax system. According to a 2015 Pew Research Center poll, Republicans were significantly more likely than Democrats to view the tax system as too complex and to feel bothered by the amount of taxes they had to pay. The GOBankingRates survey also asked respondents about their household income, debt and household size. Household debt and size did not show a strong correlation to specific personal finance challenges; however, income level did correlate somewhat to financial burdens. People with lower incomes tend to say that their low incomes are the source of the biggest money struggles. “Insufficient income is certainly a challenge if you’re struggling to pay bills and stay afloat financially,” Huddleston said. Those earning higher incomes, on the other hand, are more likely to say taxes are their most challenging personal finance issue. “If you’re in the highest tax bracket and hit by a tax rate of 39.6 percent, it makes sense that you consider taxes to be a big financial challenge,” Huddleston said. Whatever Americans’ income levels, there are many factors they face that can complicate finances. Some of these factors, such as taxes, are outside of the immediate control of Americans. The Financial Burdens Survey shows, however, that many Americans are still struggling with basic financial challenges like earning enough and living within their means. These findings underscore the need for many people to focus on the basics of personal finance that they can control: setting and sticking to a budget while working to grow their income and increase their value to employers. Even when facing financial difficulties, Americans can stretch their money further by practicing sound money management and making smart financial moves to maximize opportunities and minimize risk. Methodology: This survey was conducted by GOBankingRates through Survata and collected 1,007 responses from March 16-17, 2016, with a margin of error of 3.1 percent. It posed two main questions asking Americans about what they considered to be the most significant financial burdens for the U.S. economy and for their personal finances. The first question asked, “Below are some of the financial burdens for the U.S. economy today. Please rank them from most to least significant.” Respondents were given the following six possible options and were asked to rank them from No. 1 to No. 6, with 1 being the most significant: (1) healthcare costs, (2) Social Security benefits, (3) higher education costs, (4) tax increases, (5) income inequality, and (6) military spending. Answer options were displayed in random order. The second question asked, “Below are some personal financial concerns. Please rank them according to how challenging they are for you.” Respondents ranked the following six answer options from No. 1 to No. 6, with 1 being the most challenging: (1) high cost of living, (2) healthcare costs, (3) insufficient income, (4) taxes (income, property, and/or other taxes), (5) retirement savings, and (6) higher education costs. Answer options were displayed in random order. Using responses to these questions and Survata’s data on respondent age and gender, GOBankingRates analyzed responses to produce the findings of its survey. Combat the most expensive types of disease.